A parathyroidectomy is a surgery to remove parathyroid glands. 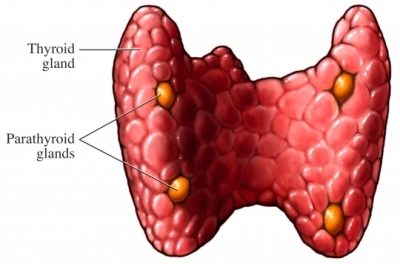 There are 4 parathyroid glands located in the neck. The glands make a hormone that balances the level of calcium in the blood. The surgery is done to remove one or more abnormal parathyroid glands. The glands may be overactive, or abnormal due to cancer or for other reasons. Arrange to have someone drive you home from the hospital after surgery. Avoid eating or drinking 6-8 hours before surgery. Talk to your doctor about your medications, herbs, and dietary supplements. You may be asked to stop taking some medications up to 1 week before the procedure. General anesthesia is used most often. It will block any pain and you will stay asleep through the surgery. The area will be numb but you will be awake. An incision will be made in the neck. Muscle and other tissue will be moved to locate all the glands. The abnormal gland or glands will then be cut out and removed. A drain may then be placed in the area. This will allow fluids to drain out of the area while you heal. The incision will be closed with stitches. If all 4 glands were removed, a part of one gland may be placed in a different area of the neck or in the forearm. You may need to stay in the hospital for 1-2 days. Your doctor may choose to keep you longer if you have any problems. Observe you in the recovery room. Check on your ability to swallow and speak. Show you how to change your dressings and care for your wound. Remove the drain if one was placed during surgery. You may be given calcium supplements. Farndon JR. Surgical treatment: Evidence-based and problem-oriented. Postoperative complications of parathyroidectomy. Available at: http://www.ncbi.nlm.nih.gov/books/NBK6967. Accessed December 28, 2018. Parathyroid surgery. The American Association of Endocrine Surgeons website. Available at:http://endocrinediseases.org/parathyroid/surgery%5Foverview.shtml. Accessed December 28, 2018. Parathyroidectomy. Cedars-Sinai website. Available at: http://cedars-sinai.edu/Patients/Programs-and-Services/Head-and-Neck-Cancer-Center/Treatment/Parathyroidectomy.aspx. Accessed December 28, 2018. 6/6/2011 DynaMed's Systematic Literature Surveillance http://www.ebscohost.com/dynamed: Mills E, Eyawo O, Lockhart I, et al. Smoking cessation reduces postoperative complications: a systematic review and meta-analysis. Am J Med. 2011;124(2):144-154.